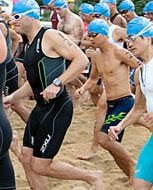 This is my second aquathon at Repulse Bay, Hong Kong. I hope in a year I'll look back and laugh, but I think I should cry.. Well, at least I didn't drown. My training partner and I were not happy about the trash floating in the water.. Easy to gulp down plastic straws and stryofoam.. Also, the 2-2.5k back and forth on a narrow walking lane made it difficult to run. So, overall - I could say.. I wasn't very happy about the race. I am working on the swim.. I free-style swim, but even the breast strokers was beating me.